A mother in Michigan believes “medicine” she makes at home is curing her child’s brain cancer. Becky F. posted an update on Facebook announcing her success using marijuana to heal her daughter’s cancer. She believes that distilling marijuana in coconut oil will keep her daughter cancer free for life, cure her seizures, and replace her daughter’s need for additional chemotherapy and radiation. According to Becky, her daughter suffers from multiple illnesses including seizures pain, nausea, and brain cancer. Her daughter has undergone numerous brain surgeries, chemotherapy, and radiation to treat the disease. When doctors discovered her daughter’s brain cancer returned, Becky decided to take matters into her own hands. Becky decided instead of putting her daughter through radiation and chemotherapy that she would treat her daughter’s cancer with marijuana. “Can you guess what I’m doing?! Following her exciting announcement, Becky went on to list the benefits her daughter has experienced. Becky believes her concoction of marijuana and coconut oil has eliminated her daughter’s cancer, reversed brain damage, stopped seizures, replaced chemo and radiation, and has kept her cancer free for two years. THIS saved my daughters life! THIS reversed side effects from radiation to her brain that were supposed to be permanent! Cannabis has taken the place of OxyContin and morphine after a 2nd brain surgery! Cannabis took the place of zofran and to control nausea and vomiting! THIS took the place of periactin and megace to increase her appetite! Cannabis took the place of Benadryl and sleep aides to help her sleep! THIS took the place of all the chemo meds and complete cranial spinal radiation they wanted to do on my daughter when she relapsed! And THIS CURED MY DAUGHTERS BRAIN CANCER AND HAD CONTINUED TO KEEP HER CANCER FREE FOR ALMOST 2 years! After she uploaded her post, commenters went wild. Mothers with sick children asked Becky for advice on how to treat their children. One mother asked Becky if marijuana would cure her daughter’s neurodegenerative disease. Other parents of children with cancer, asked Becky if abandoning chemo and radiation will cure their children. One mother asked Becky if she could help her treat her daughter’s and her own lung cancer. As more people jumped onto Becky’s promise of a cancer cure, others started to push back on her claims. According to the American Cancer Society marijuana is not proven to treat, prevent, or cure cancer. However, marijuana is approved in many states to manage symptoms associated with cancer and cancer treatment. Cancer patients that use marijuana can see improvement in appetite, pain, and nausea. “There have been some early clinical trials of cannabinoids in treating cancer in humans and more studies are planned. While the studies so far have shown that cannabinoids can be safe in treating cancer, they do not show that they help control or cure the disease. Becky’s claim that the cannabis cured her daughter’s cancer is unfounded. The American Cancer Society indicates that the only benefits from cannabis or marijuana are when the plant is smoked or eaten. Reducing the plant into an oil extract has not been studied. Additionally, there is little to no evidence that cannabis oil can help with nausea, vomiting or pain. “A number of small studies of smoked marijuana found that it can be helpful in treating nausea and vomiting from cancer chemotherapy. Although her method is not studied nor approved to treat cancer, Becky fought back against attacks by commenters. One commenter, Amanda, suggested Becky’s claim provided false hope to desperate people. Amanda became worried about Becky’s claims because Amanda’s uncle died from the same form of brain cancer. In their exchange, Becky shared a copy of her daughter’s MRI from 2017. Following the 2017 MRI, Becky said her daughter had brain surgery. Doctors recommended chemotherapy and radiation, but Becky declined these treatments. Instead, Becky opted to use marijuana oil to treat her daughter. Becky provided a copy of her daughter’s MRI written report. The report indicated the presences of a lesion in the brain. The radiologist noted lesion growth from August 2017 to February 2018. 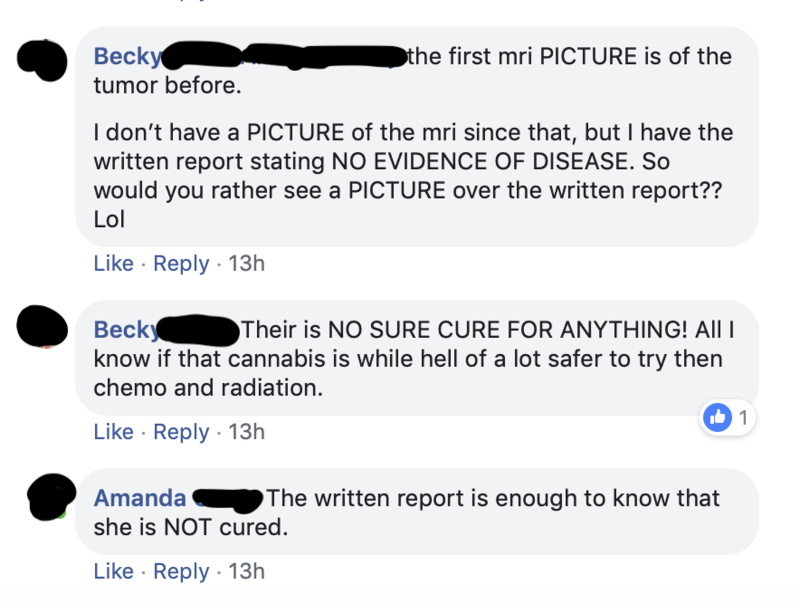 Commenters pushed back and insisted that the MRI report does not indicate remission or cancer cure. Additionally, Amanda pointed out that the MRI proves that her daughter has on-going issues and a lesion. Even though numerous people pushed back, others cheered on Becky for choosing marijuana for her daughter. Several people shared their success using marijuana to treat chronic pain and nausea. However, no one in the comments said marijuana had successfully cured their cancer. Becky’s daughter has an aggressive form of brain cancer called Medulloblastoma. The disease produces tumors throughout the brain and spinal cord. Tumors are fast growing, and aggressive treatment is needed to stop cancer’s progression. Surgical resection of the tumors followed by chemotherapy and radiation has proven to slow the progress of the disease. According to St. Judes, medulloblastoma has a 70-80% survival rate if the tumors have not spread to the spinal cord. If the tumors spread to the spinal cord, the survival rate is 60%. Children under age three at diagnosis have the poorest prognosis. Becky’s daughter has undergone multiple resections and rounds of chemo to treat her cancer. Due to this fact, there is no way to determine the effectiveness of cannabis in treating the disease. Even though her claims sound miraculous, there is no likelihood that cannabis cured her daughter. Nor should her statements be used as a reason for a patient to abandon traditional cancer treatments. Alternative medicine is not proven for cancer treatment. People that use alternative therapies instead of chemotherapy and radiation are five times more likely to die. While her daughter may be in a phase where her cancer is not growing as quickly, reports do not support Becky’s claims.